In this post, we will see how to create Spring boot web application example using JSP. 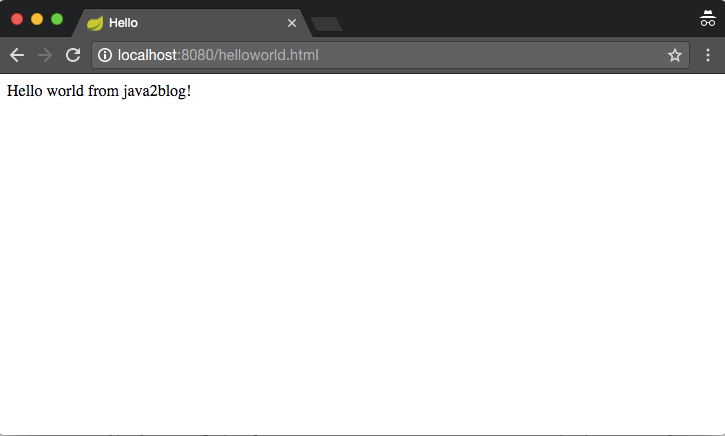 Let’s see how Spring boot makes over life simpler.I am going to create Spring MVC hello world example using Spring Boot. 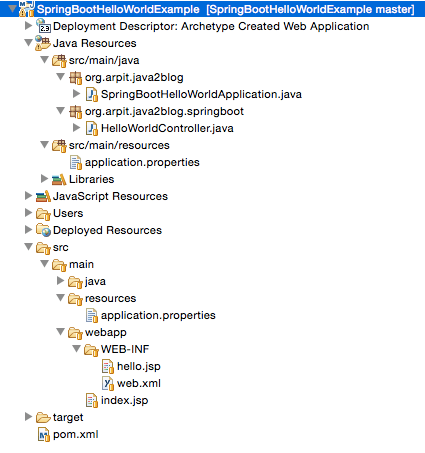 Here are steps to create a Spring boot web application example Using JSP. 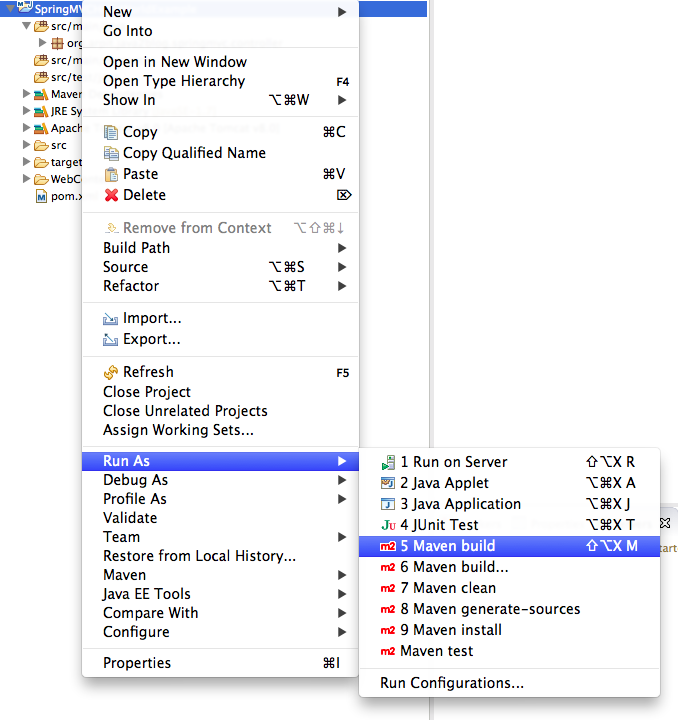 Step 1: Create a dynamic web project using maven in eclipse named “SpringBootHelloWorldExample”. The spring-boot-starter-parent provides you all maven defaults required for any spring project. Since we are developing a web application, we also need to add spring-boot-starter-web dependency. This will include additional dependencies such Spring boot, tomcat etc which are required for this application. If you notice, we did not provide any version for specific components. You just need to provide version no. (1.5.3.RELEASE) for spring boot. above method will get called. We have just added @SpringBootApplication and it does all the work. Let’s understand more about this annotation. @Configuration makes the class as a source of bean definitions for the application context. 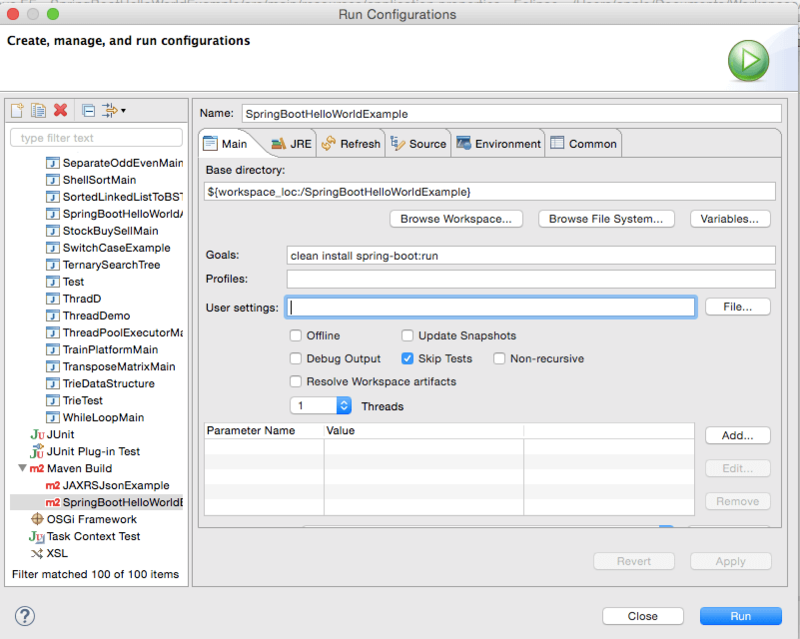 @EnableAutoConfiguration enables Spring boot to add beans presents in classpath setting and various property setting. Normally you would add @EnableWebMvc for a Spring MVC application, but Spring Boot adds it automatically when it sees spring-webmvc on the classpath. This flags the application as a web application and activates key behaviors such as setting up a DispatcherServlet. @ComponentScan tells Spring to look for other components, configurations, and services in the default package, allowing it to find the controllers. If specific packages are not defined, scanning will occur from the package of the class that declares this annotation. Step 5: Create a property file named application.properties as below and put it in src/main/resoures. Above two properties are very much similar to used in springmvc-dispatcher-servlet.xml in Spring MVC example. That’s all about Spring Boot hello world example. Step 8: It ‘s time to do maven build. [INFO] Changes detected – recompiling the module! 2017-04-28 14:20:13.227 INFO 1051 — [ost-startStop-1] org.apache.jasper.servlet.TldScanner : At least one JAR was scanned for TLDs yet contained no TLDs. Enable debug logging for this logger for a complete list of JARs that were scanned but no TLDs were found in them. Skipping unneeded JARs during scanning can improve startup time and JSP compilation time. Step 10: Let’s test the application now. As Spring uses embedded tomcat, you can access the project using http://localhost:8080/index.jsp. When you click on above link, you will get below screen. 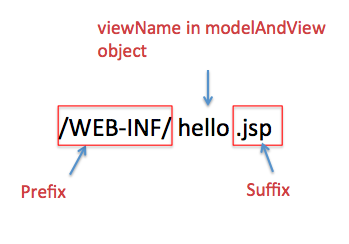 That’s all about Spring boot web application example using JSP. If you find any issue with this project, please put a comment.